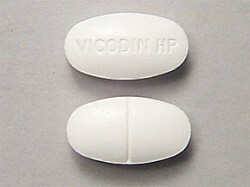 Vicodin is a combination pain reliever with the ingredients of hydrocodone, an opioid, and acetaminophen, an analgesic. There are numerous hydrocodone medication brands prescribed to treat moderate to moderately severe pain, but, Vicodin is one of the most popular, with a high potential for abuse and addiction. Vicodin is one of the most abused medications by those who want to experimentally or recreationally get high. It produces euphoria by increasing dopamine levels in the brain which also plays an important role in reinforcing addiction to substances. Over time, the altered brain functions signal the cravings for Vicodin in, essentially, the same way they signal hunger for food. Frequent Vicodin abuse can lead to symptoms of withdrawal. Long term use or abuse of Vicodin can lead to dependency and the person will suffer physical withdrawals when their dosage is reduced or discontinued. Many times, a person will choose to continue using Vicodin in avoidance of these conditions which increases the tolerance, or need to use more, and adds to the dependency levels making the next attempt to quit much harder. “Addiction is defined as a chronic, relapsing brain disease that is characterized by compulsive drug seeking and use, despite harmful consequences”, according to the National Institute on Drug Abuse and opioid drugs, like Vicodin, are some of the most addictive substances on the planet. Running out of Vicodin long before prescription schedule ends. Attempting to obtain more Vicodin after original conditions of pain have subsided or prescription has been terminated. “Doctor Shopping” or obtaining Vicodin prescriptions from multiple sources. Fraudulently obtaining Vicodin by faking pain or lying to doctors, forging prescriptions, or stealing the medication from others. Overly anxious regarding doses, worry of running out, and protecting Vicodin supplies. Unexplainable lack of money due to purchasing Vicodin on the street. Spending more time with other Vicodin users. Isolation from family and non-using friends. Withdrawal symptoms of anxiety, irritation, nausea, vomiting diarrhea, muscle aches, mood swings, and insomnia when dosage is drastically reduced or unavailable. Repeat relapses or unsuccessful attempts to quit. Personality, mood, or behavioral changes that result from Vicodin use or non-use; such as euphoria, excitability, and motivated behaviors when using and depression, aggression, anxiety, irritation, or restlessness, when not. Loss of interest in important or once loved activities such as hobbies or exercise, with preoccupation of Vicodin use. Continued use despite harm or stress to self and others. Continued use despite financial, legal, employment, academic, social, or health problems. Vicodin Street Names - Vicodin is a popular prescription drug for pain relief. Because of some of its side effects, it is often abused, and thus, it has acquired a variety of code names.